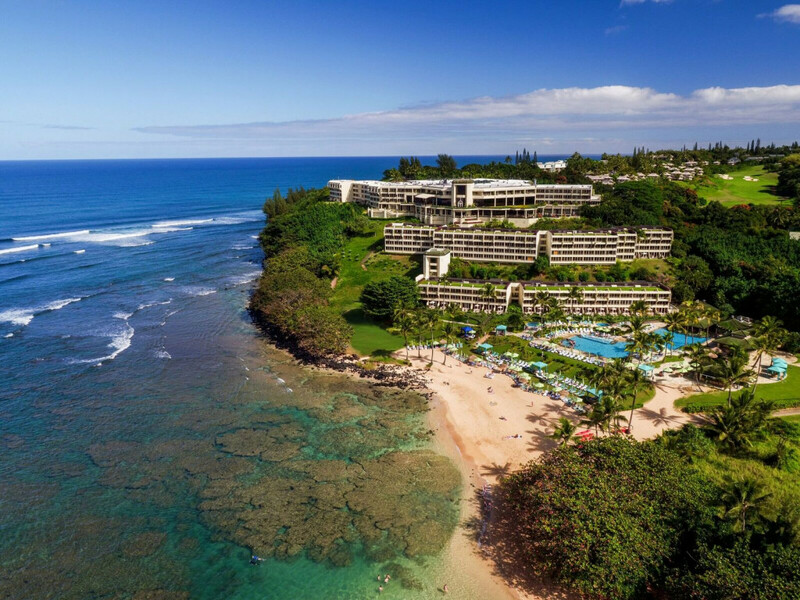 Pretend life’s a perpetual vacation against the backdrop of this contemporary Princeville's Resort outpost on Kauai's northern shore. Situated among Princeville’s gated communities, you can grab your golf buddies for a round on the hotel's greens or unlock a room with views of the oldest Hawaiian island’s verdant Napali Coast. 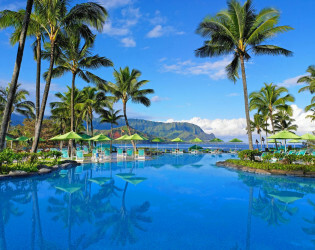 The brand's attention-to-detail is evident in the hotel services: arrange for lunch on behalf of a private butler or nosh on pineapple spears poolside. Events beyond expectations. 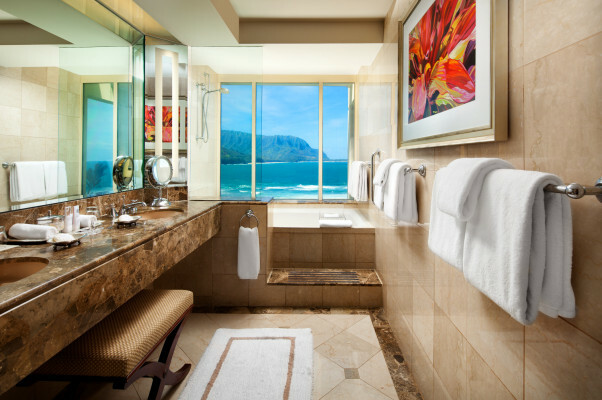 For occasions which require an address beyond the ordinary, there is the Princeville Resort. 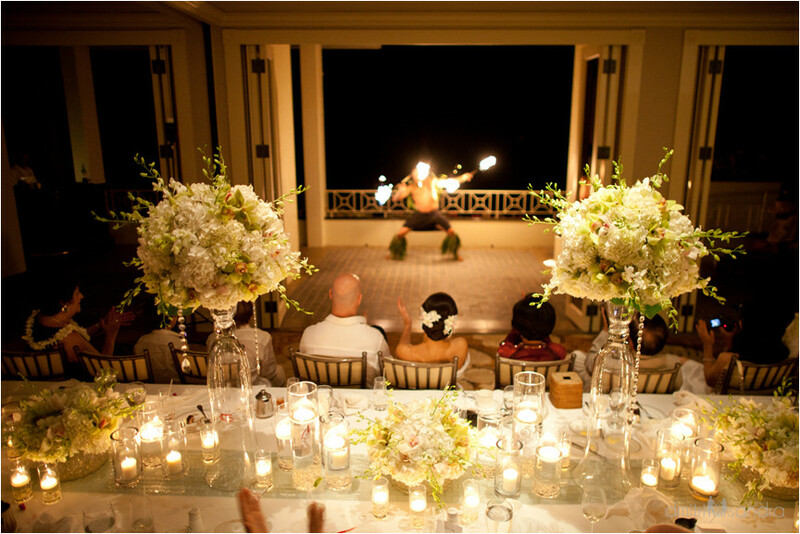 Events unfold with flawless precision, revealing a remarkable intuitiveness and uncompromising attention to detail. 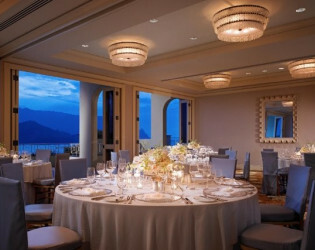 It is the destination for the most privileged of meetings, banquets and weddings, when nothing less will suffice. 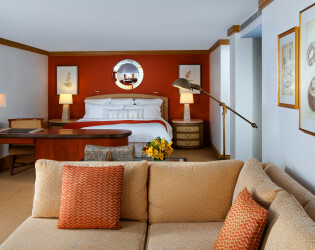 For a room block, the minimum is 10 guestrooms over a two night period stay. Forever Starts Here. As the sun kisses the horizon and you are bathed in golden light, your vows are lifted by eternal trade winds and scattered over a million miles of Pacific. 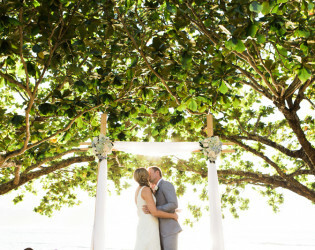 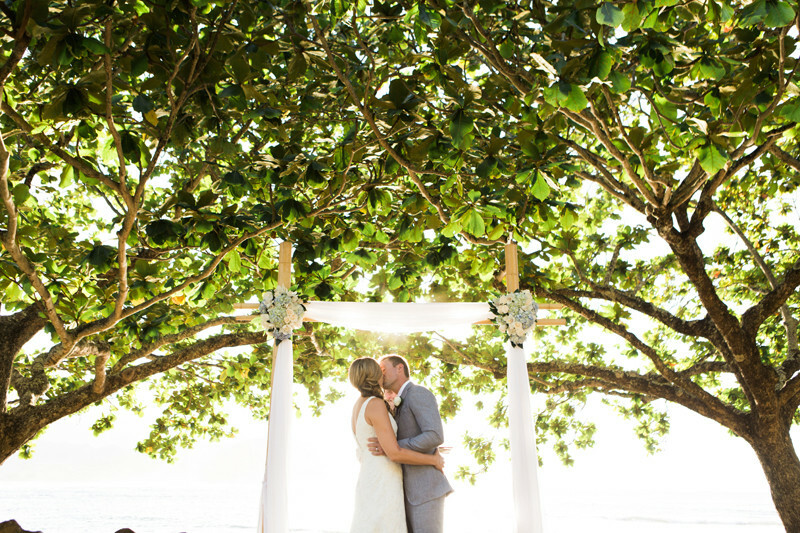 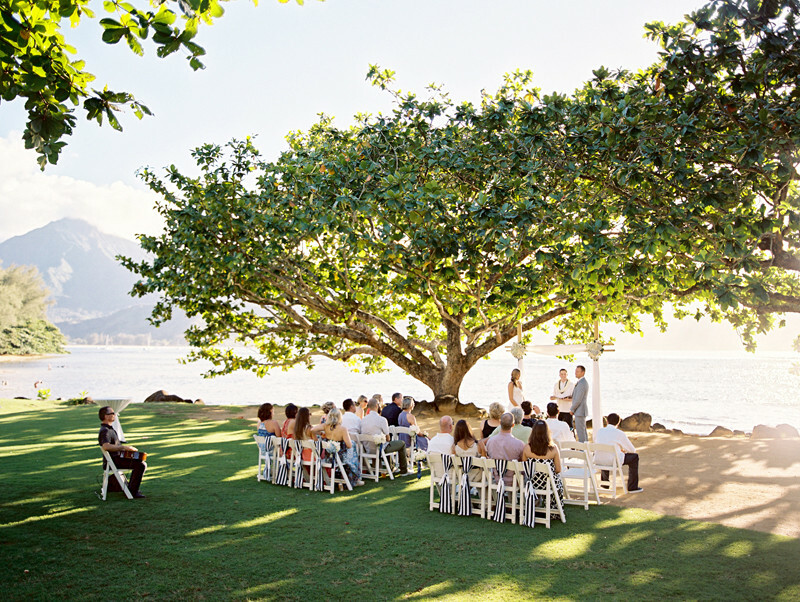 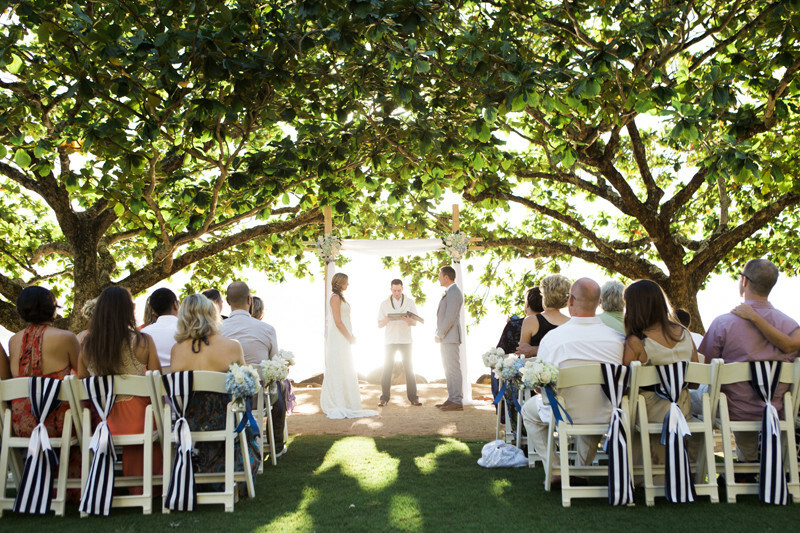 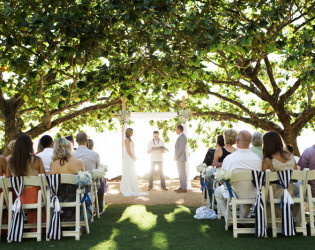 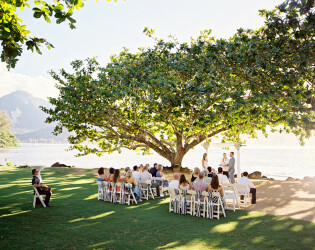 Whether you envision an intimate ceremony under the canopy of a kamani tree, or a grand affair in a ballroom open to the sea, our Princeville wedding celebration consultants defy any impediment to the realization of your dream. 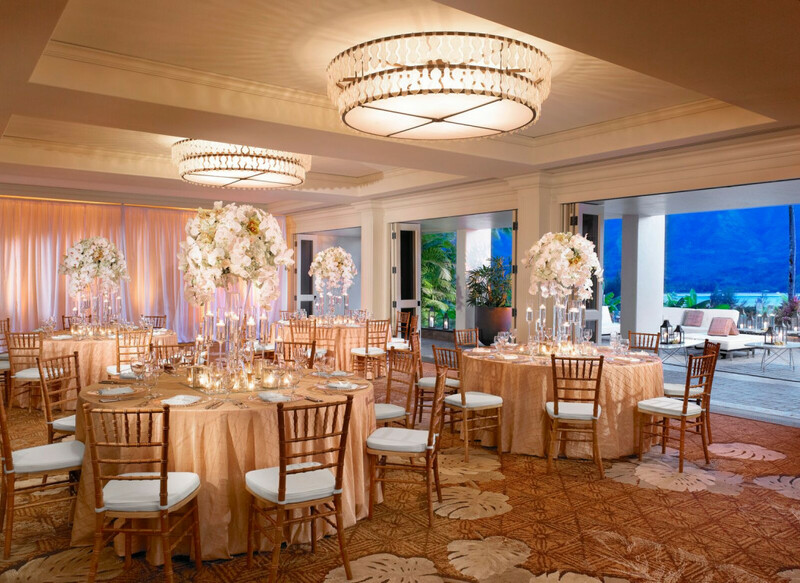 The Grand Ballroom graciously accommodates social functions of up to 500 in 6,616 square feet and can be divided into four sections. The 2,868-square-foot Bay Terrace offers spectacular vistas for receptions or additional gathering space. Five conference rooms offer an additional 3,128 square feet for more intimate gatherings. 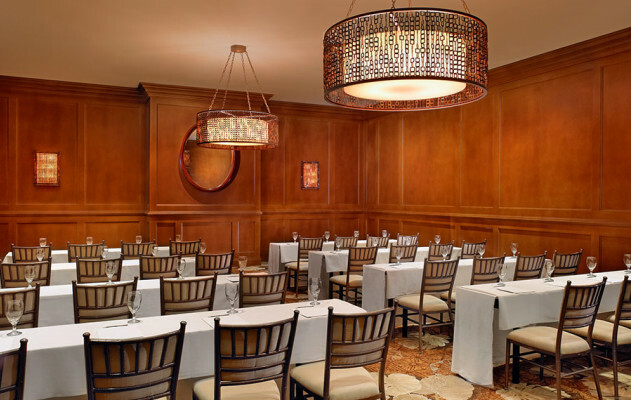 All conference venues are complemented by a spectrum of audio and visual services. 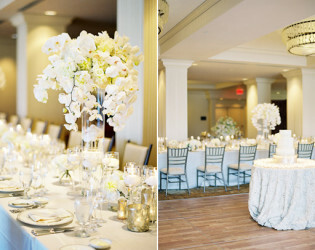 Custom designed theme events and catered social affairs. 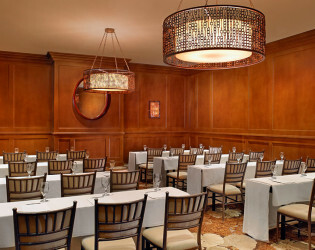 Elegant culinary experiences tailored for group needs. 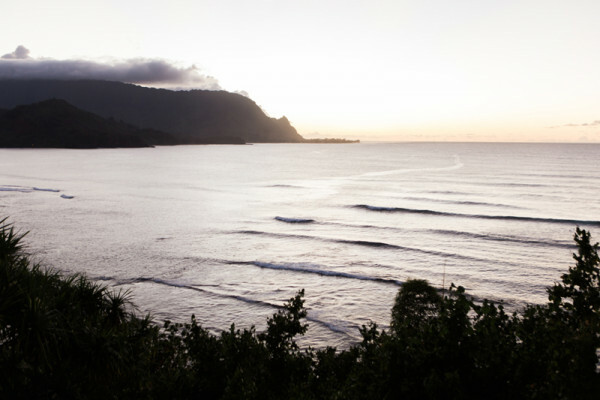 Having emerged from the sea millions of years before its neighboring islands, Kaua'i is home to the softest sands, grandest rivers and most verdant rain forests in all of Hawai'i. 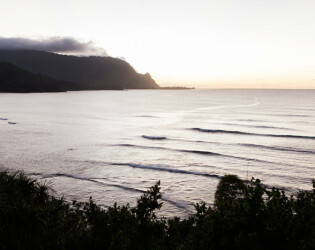 Archaeological evidence suggests that Kaua'i was the first island populated by seafaring Polynesians about 400 A.D. 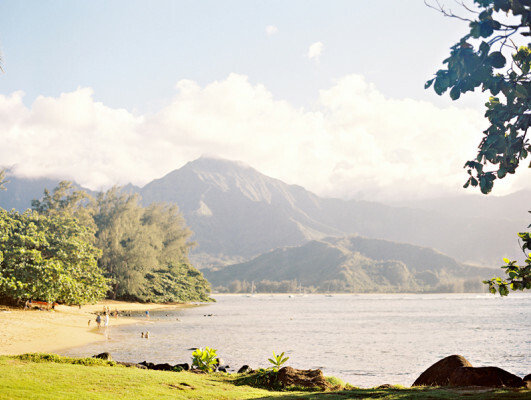 Historically, the name Kaua'i has been translated to mean "season of abundance" or "time of plenty". 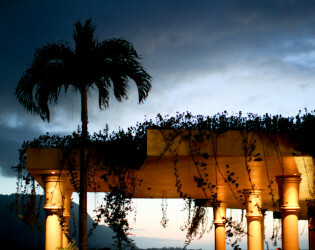 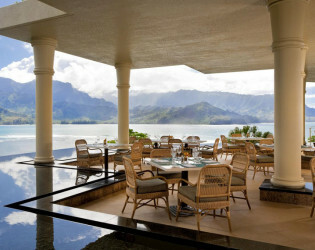 Princeville Resort resides on the northern shore of the "Garden Island". Located in the 9,000 acre resort community of Princeville at Hanalei, this ocean side enclave provides residents and visitors all the amenities you would expect from an island destination considered by many to be one of the most spectacular in Hawai'i. 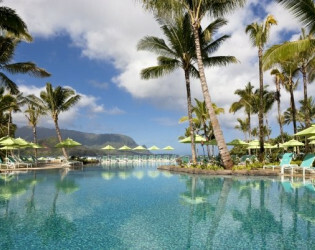 The Lihue Airport is approximately 32 miles south of Princeville and served by inter-island and major airline carriers. 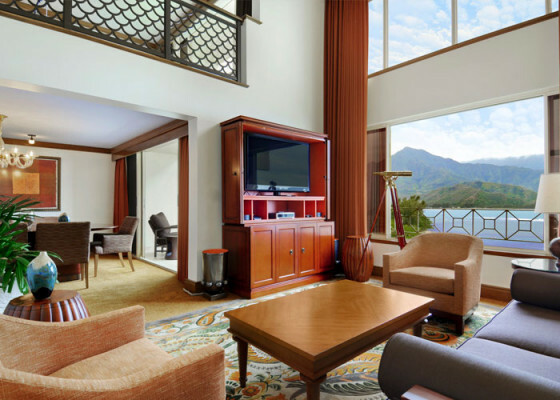 Guests of Princeville Resort reside in a bastion of tropical sophistication, surrounded by interiors reflecting Kaua'i's rich abundance, cuisine that celebrates local flavors and an array of activities as thrillingly diverse as the island itself. 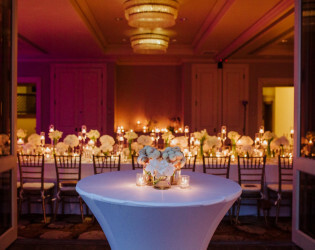 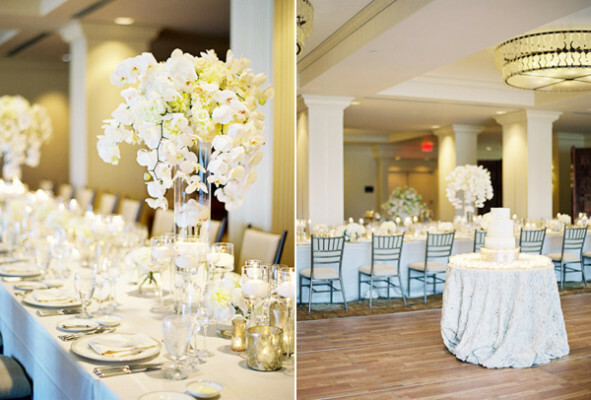 Your private reception will include the following: private breathtaking venue, white or Ivory Rivolta linens from Italy, Rosenthal fine bone china, Spiegelau Stemware, 72 -inch tables, imperial tables and rectangular tables; cocktail tables and cake table, and wedding bar set-up. 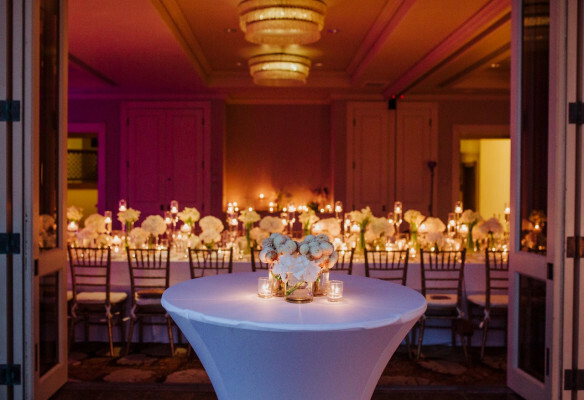 Specialty linens in a variety of fabrics are available for an additional fee, and floral décor and music are available for additional fees. 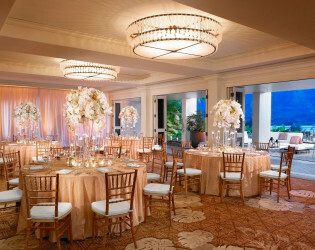 It is the destination for the most privileged of meetings, banquets and weddings, when nothing less will suffice. 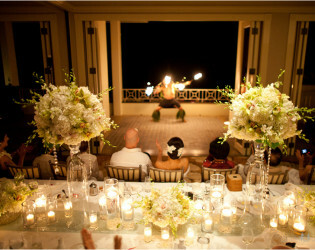 Events unfold with flawless precision, revealing a remarkable intuitiveness and uncompromising attention to detail. Whether you envision an intimate ceremony under the canopy of a kamani tree, or a grand affair in a ballroom open to the sea, our Princeville wedding celebration consultants defy any impediment to the realization of your dream. 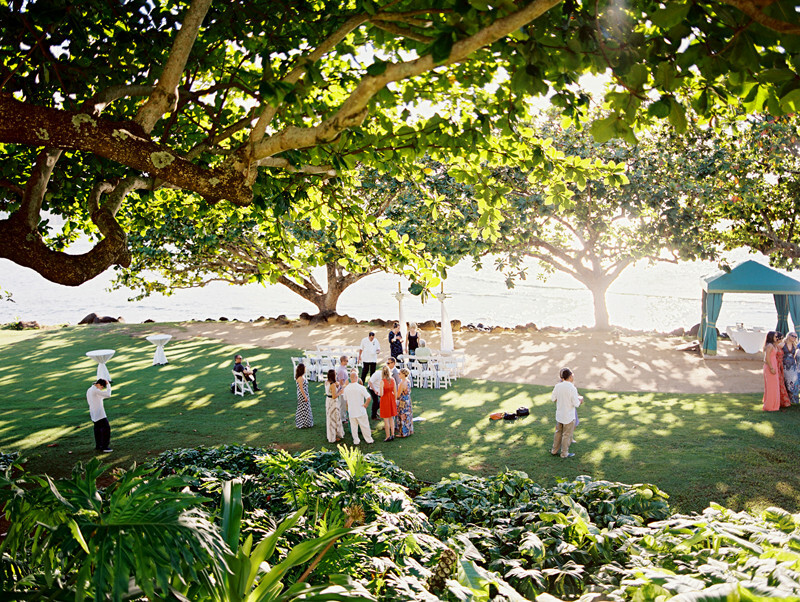 The view from Kamani Cove, our most popular ceremony venue. 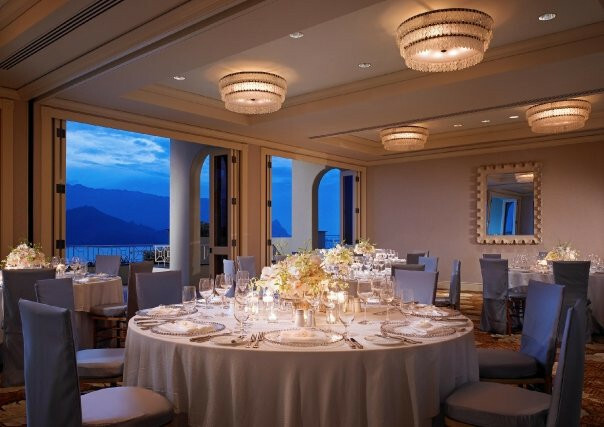 Your private reception will include the following: private breathtaking venue, white or Ivory Rivolta linens from Italy, Rosenthal fine bone china, Spiegelau Stemware, and more. 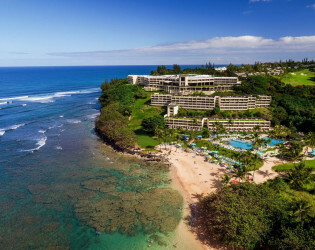 Aerial view of our resort. Custom furnishings and enchanting views are enhanced by a collection of sensory experiences created by the St. Regis Princeville Resort to enhance our guest's sense of this singular destination. St. Regis Princeville marks the legendary brand's first resort in Hawai'i and introduces an unparalleled level of sophistication and serene luxury to one of the most remarkable destinations in the world. 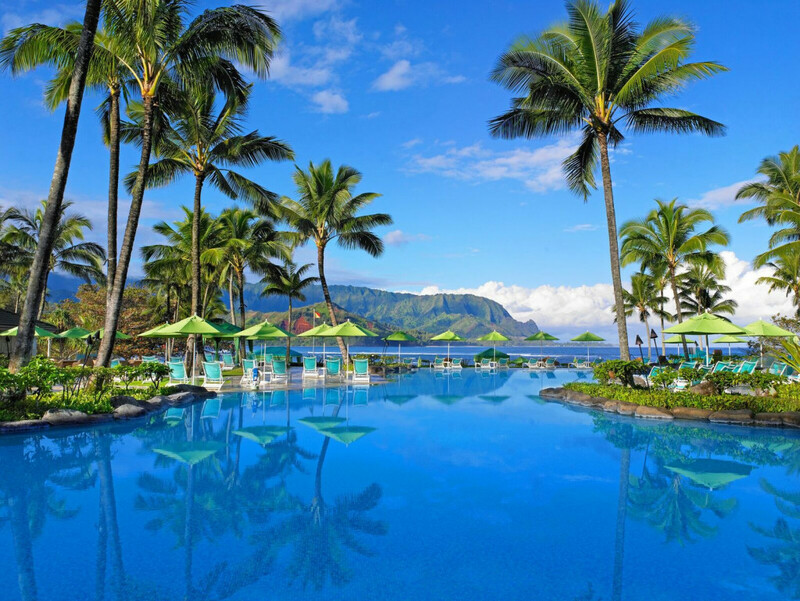 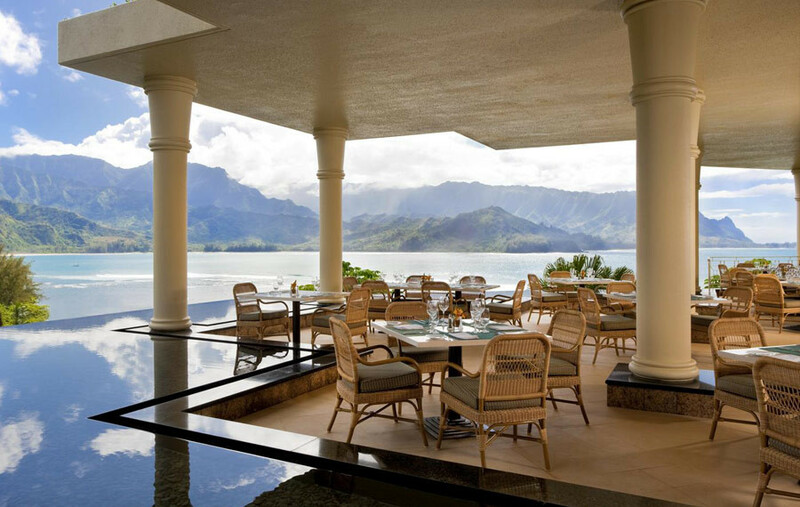 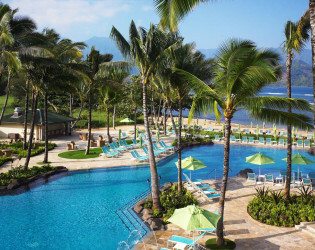 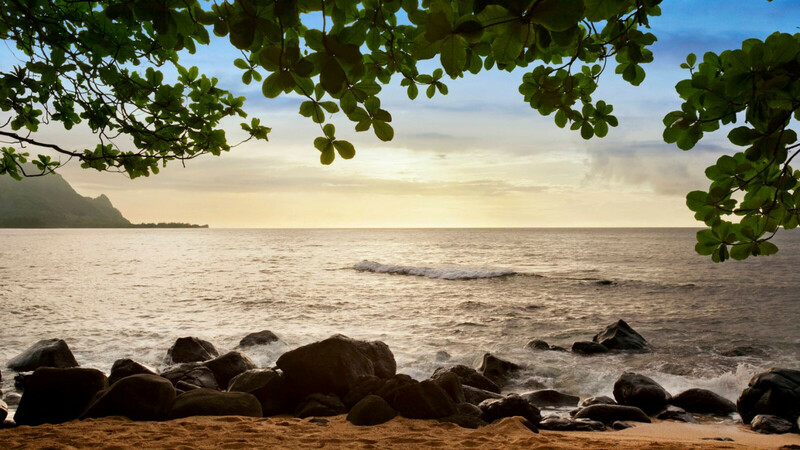 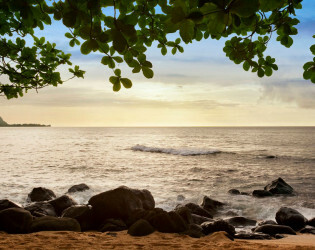 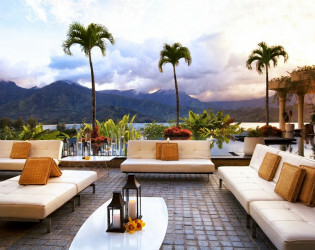 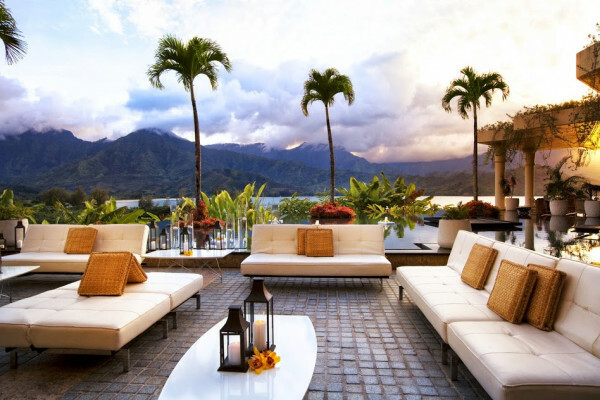 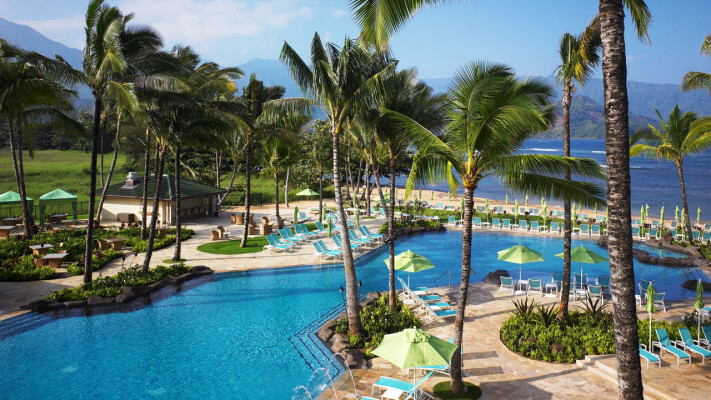 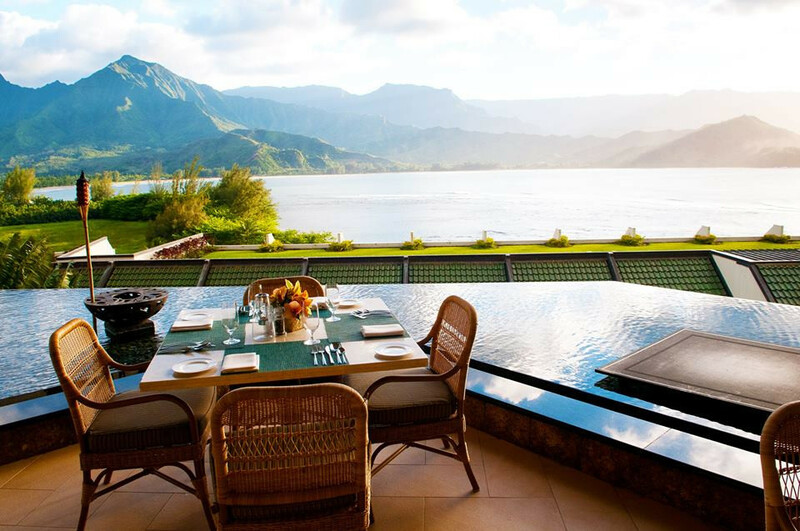 Located in the 9,000 acre resort community of Princeville at Hanalei, this luxury resort on Kauai resides on the northern shore of the "Garden Island." 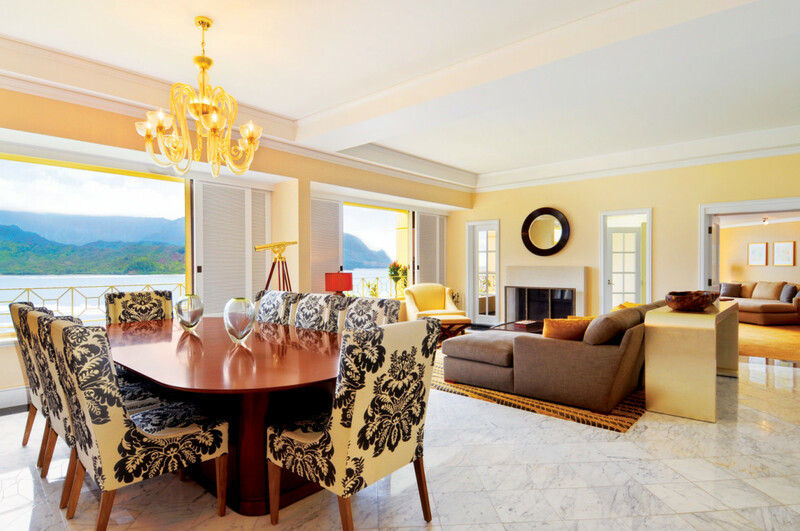 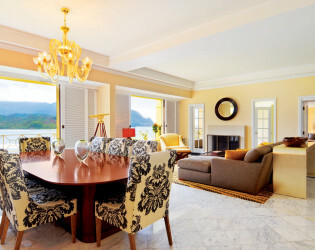 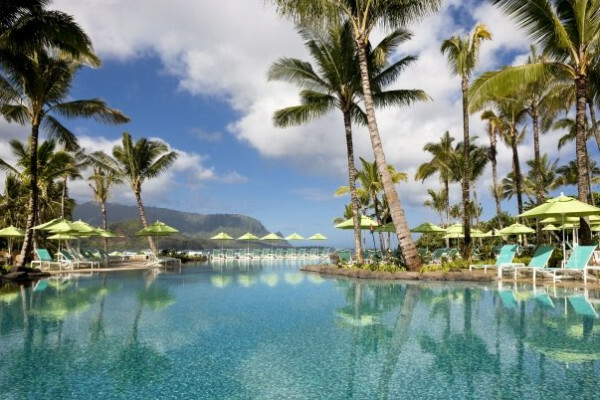 Guests of the St. Regis Princeville Resort reside in a bastion of tropical sophistication. 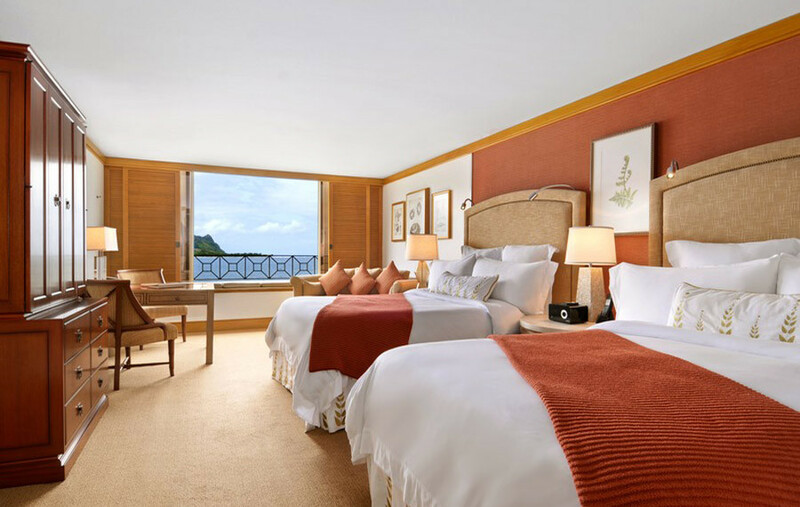 Guests rooms are both calming and seductive, the contemporary Hawaiian designed room reflects the color palette of the sky, sea and earth. Hawaiian-inspired restaurant with outdoor terrace, serving breakfast and dinner. 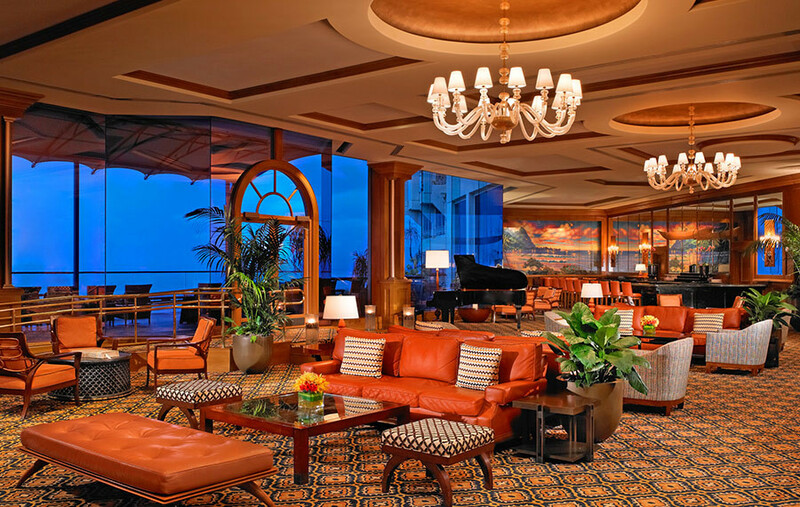 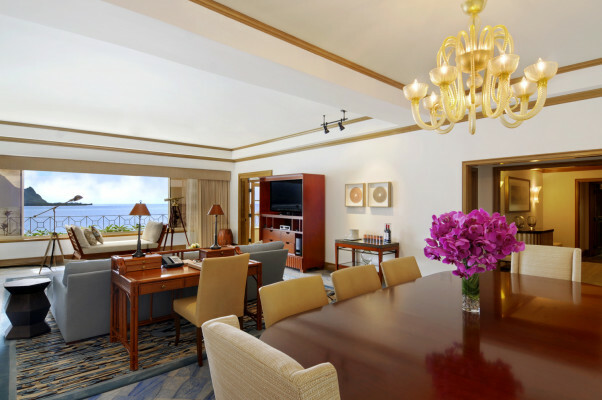 St. Regis Hotels & Resorts offers its elite clientele an experience beyond expectation. 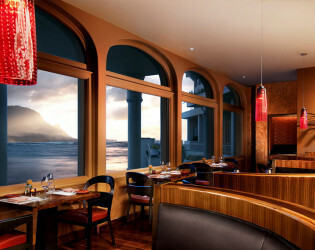 Watch the sunset against the beautiful mountains from Bay Terrace. 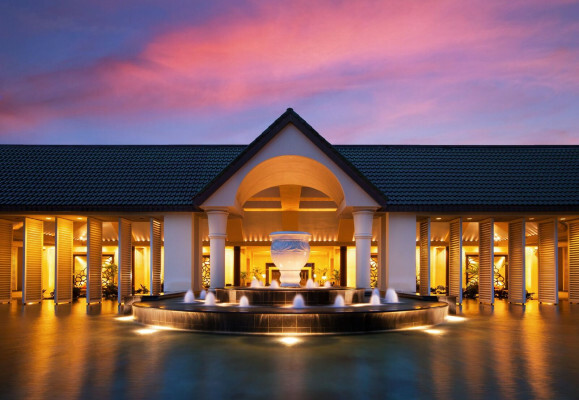 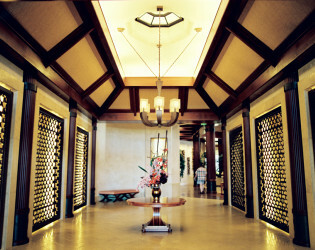 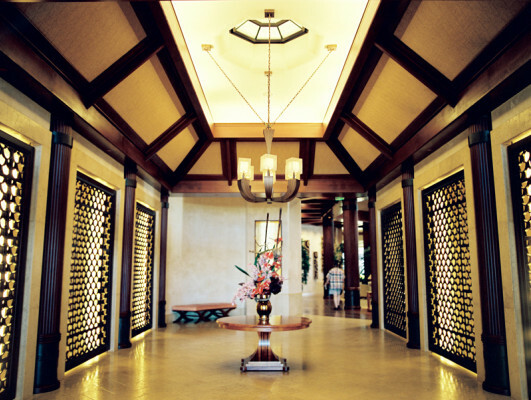 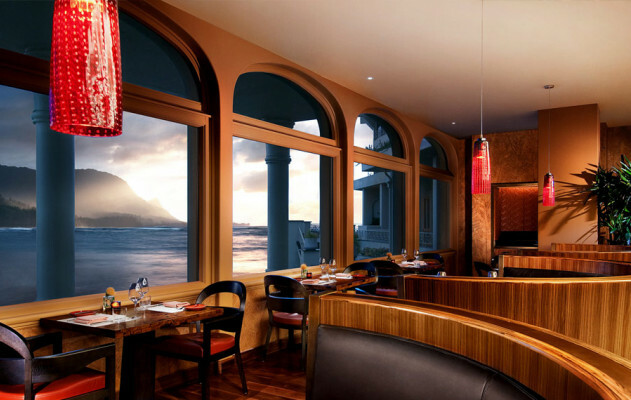 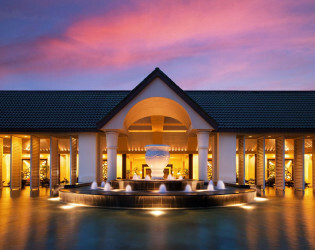 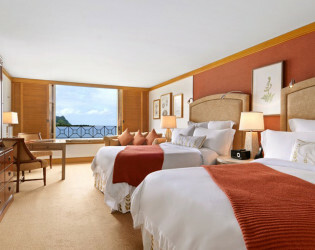 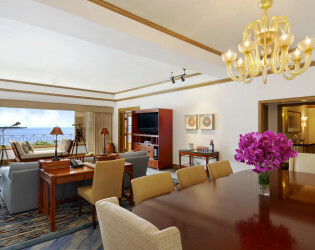 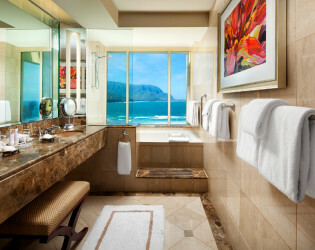 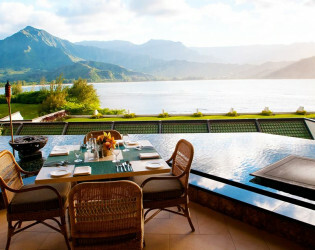 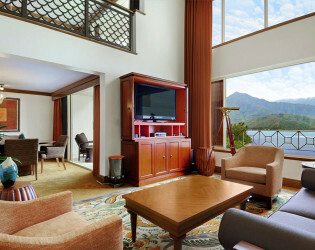 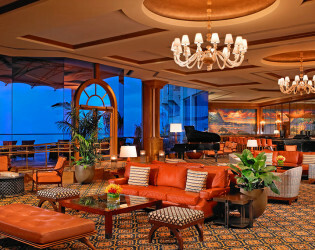 For occasions which require an address beyond the ordinary, there is the St. Regis Princeville Resort. 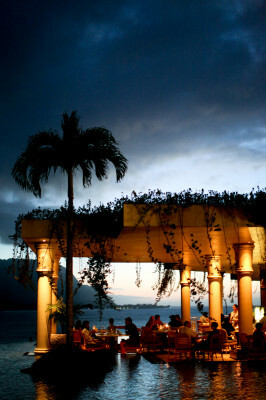 Wedding Reception at our Bay Terrace venue. 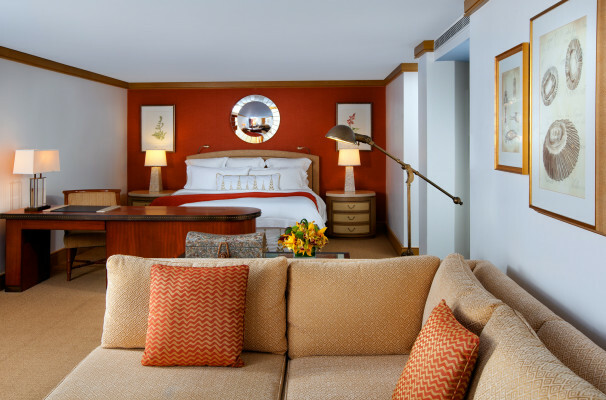 A comfortable yet elegant hideaway -- signature sophistication realized far from home. 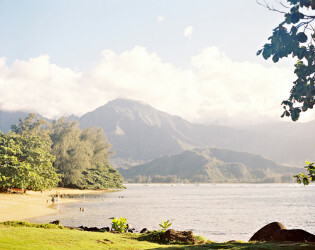 Kaua'i is an island nearly as famous for its tastes as its sights. 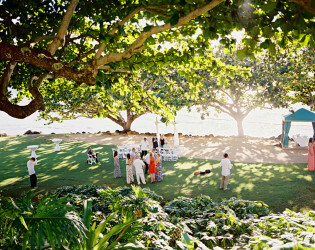 Wedding Reception at our Hanalei Suite venue. The front drive of Princeville Resort.